Published in October, 1959 by Houghton Mifflin, Milton Lott’s second novel didn’t see paperback release until this January, 1968 edition. I reported on Lott’s first novel, THE LAST HUNT, here. 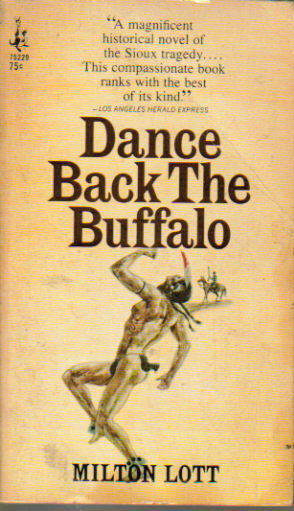 The title is somewhat of a misnomer as the Ghost Dance doesn’t appear until book three, the shortest and last section of the novel. What the book is about is life for the Sioux on a reservation. We see what the people are going through during the years of 1889 and 1890, the harsh life, so different from what they had lived before. The older men remembered the buffalo hunts and can only tell younger tribe members what the life was like. Some of the participants are Turning Hawk, Eagle Voice, an interpreter, Little Wound, a small boy both blind and deaf, Westland, an artist studying and sympathizing with the Sioux, Reverend Martin, a missionary there to “civilize” the Sioux, and his wife, Lea, who feels the plight of her husband’s charges much more so than he does. I would say this book is not for everyone. If one expects a slam bang western, this isn’t it. Lott tells his story at a leisurely pace, building his characters toward their fates, which I already knew was coming, even as sketchy as I was on the Ghost Dance. After all, it’s one of the more famous events of that time period.